JON WALTERS WAS critical of Ireland’s performance in Aarhus last night, but remains hopeful the team can turn their fortunes around in future. Speaking in his role as a pundit on Sky Sports, the attacker — who is currently out injured — lamented Ireland’s inability to create chances and suggested the forwards were not solely to blame for the team’s attacking woes. He praised the Boys in Green for the defensive aspect of the display, grinding out a 0-0 draw against a side who have lost just one of their past 16 matches, but said they must work on their attack play. “When you play like that, it’s how you turn it into creating chances and getting goals,” he said. “Goals are a problem, but I wouldn’t just blame it on strikers and say we’re missing a Robbie Keane, we’re missing this or that type of player. You’ve got to create a balance. “If you’re in a qualifying group for the Euros and you have a team like Denmark away, we will always take a 0-0 draw, although it’s not pretty or great for fans to go out and watch. Walters also suggested that it is the responsibility of the players, rather than the manager, to put things right. Every manager will have a different way of playing. I’ve played in the Ireland team where the players will sort it out. I’ll say to Seamus, when I do this, I want it there. You’ll have little relationships going on. “I’m the type of player that will sort it out, I’m not sure the modern player — and I’m not saying this is right or wrong — will do that. “A lot of players are coached through academies and it’s a different way of playing. The on-loan Ipswich forward also said that Ireland should have capitalised on a weakened Denmark team and applied the high press more regularly. “Play it out to the centre half and then everyone press. What are they going to do? They’ve got three big centre-halfs who are going to kick it long — nine times out of 10 you’re going to win the ball, they kick it out of play or you win the ball on the edge of the box. When you start to do that, you start to get a lot more chances in the game. That’s what I’d like to see a bit different from us — instead of just retreating from the halfway line and defending from there. On the pitch, when you are so defensive, that’s when a player’s got to go ‘I’m going to be the trigger.’ Down the years, I have done [it], I’ll be that trigger, I’ll say to the person behind me ‘we’re doing this’. We’re going to press. “I would have had that conversation with the players I’m doing it with, and if they don’t do it, and I go and get played around, I’ll let them know. “If three or four times that happens and you’re playing against a top-quality team, then fair enough, you do drop back to the halfway line. 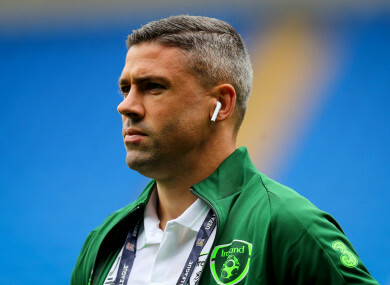 In spite of the current problems though, Walters defended the Irish management and players, saying they should ultimately judged on tournament qualification rather than the Nations League. If we had Germany or France in the group, I’d still fancy us,” he added. “We’ve done it before, with that team, with that management. Why not again? “It’s got to come from the back three also. Email “'The Denmark 'keeper had the ball and we ran back into our own half. I don't see the point in that'”. Feedback on “'The Denmark 'keeper had the ball and we ran back into our own half. I don't see the point in that'”.